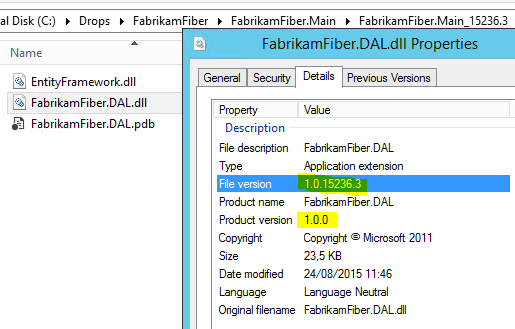 TFS Build 2015 … and versioning! Lately I got some time to play a bit more with the new build system which was released with TFS 2015 and which is also available for Visual Studio Online. The new build system was in the beginning announced as build vNext, but now with the release of TFS 2015, it’s safe to call it Team Foundation Build 2015 (TFBuild 2015) while the “old” build system can be referred to as the xaml (workflow) build system. Colin Dembovsky has a great post why you should switch to the new build sytem. In the last years, I had to implement a lot of customizations into the xaml build system and I became very productive with the workflow activities. Along the way I developed a number of generic activities which I could reuse for other assignments and I really knew my way around in the build workflow. 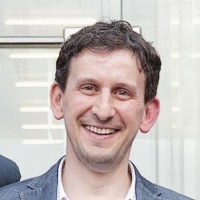 In many cases, the TFS Build Extensions were used to not reinvent the wheel. So, in the first phase I was a bit sceptic about the rise of yet another build system, but I clearly saw some interesting advantages which are explained in the post by Colin. One disadvantage of the xaml build system is the steep learning curve to master the customization process and also the deployment mechanism to refresh the TFS build controller(s). But like I experienced, once you got there, you were able to integrate very powerful customizations into the build process. Anyway, the “old” build system won’t disappear and you can still rely on this functionality for quite some time in the future, but I recommend to have a good look at the new build system and use it for your new/future build definitions. In this post I want to share how I integrated a common activity in the build process: Versioning. With the available build steps it has become extremely simple to hook your own scripts into the build process. In your scripts you will have access to some predefined build variables. 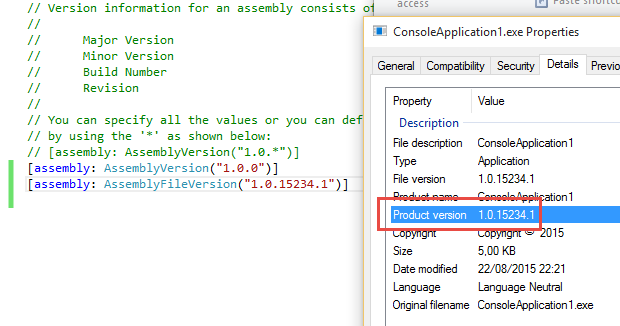 In my previous blogpost I wrote about adopting a Global .NET Versioning Strategy and the existence of a third (optional) version attribute: AssemblyInformationalVersion. Let’s use this strategy to add versioning to a sample Fabrikam software application. In the screenshot above you will see that I launch a powershell script (PreBuild.ps1) before building the solution and I pass one argument productVersion to the script. 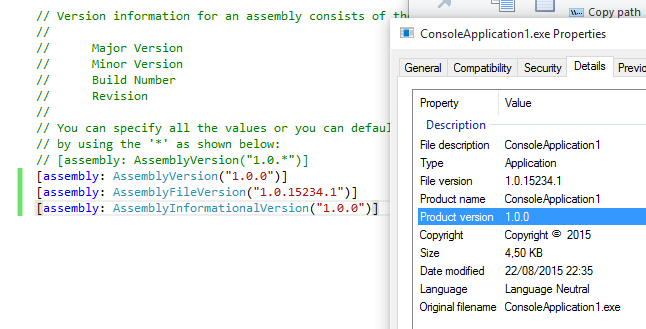 The powershell script will do the magic in the background to replace all versioning values for AssemblyVersion, AssemblyFileVersion and AssemblyInformationalVersion in the Assembly Info files, based on this product version. The product version will be passed as a whole to the AssemblyVersion and the AssemblyInformationalVersion attributes. The AssemblyFileVersion will be replaced with a full version number which will consist of the major and minor version number of the product version, a Julian based date and an incremental build number. I also modified the build number format to have some more version information displayed in the build run. I added a gist at GitHub to share the powershell script. Note that the script has been used for experimentation and may not be ready to be used for production. it certainly lacks some proper validation and error-handling. Use at your own risk. Also have a look at some similar inspiring blog posts about versioning TFS Builds which helped me to develop the powershell script that works for my scenario. 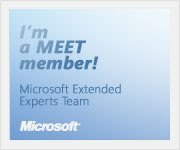 You are currently browsing the Into ALM with TFS/VSTS blog archives for August, 2015.